The Olympics includes some weird sports. Curling is one, despite its recent (some might say baffling) surge in popularity. Biathlon, that combination of cross-country skiing and shooting wildly popular in the Nordic countries, is often at the bottom of the ratings among Olympic broadcasts. 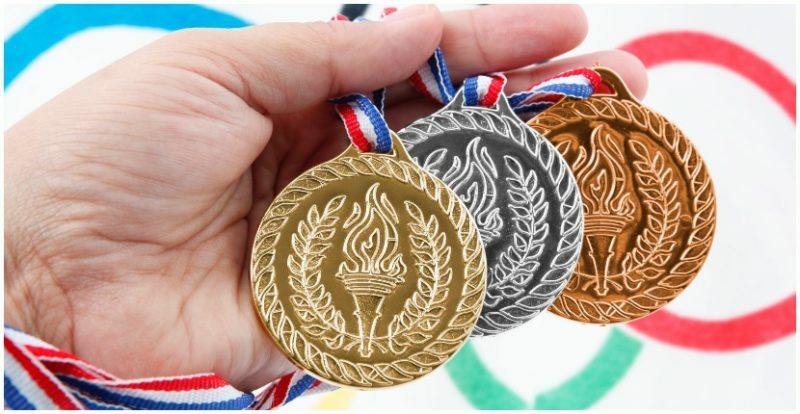 Here are some strange events that have been eliminated from the competition since the modern Olympics began in 1896. Actually, this sounds like it SHOULD be in the Olympics! 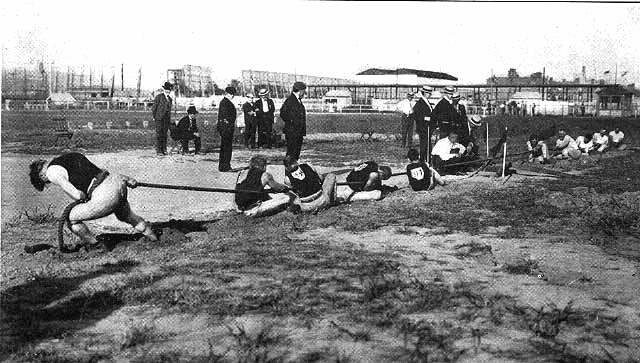 A perennial schoolyard favorite in the United States and the United Kingdom, “Tug of War” was in the Olympics for 20 years, from 1900 to 1920. 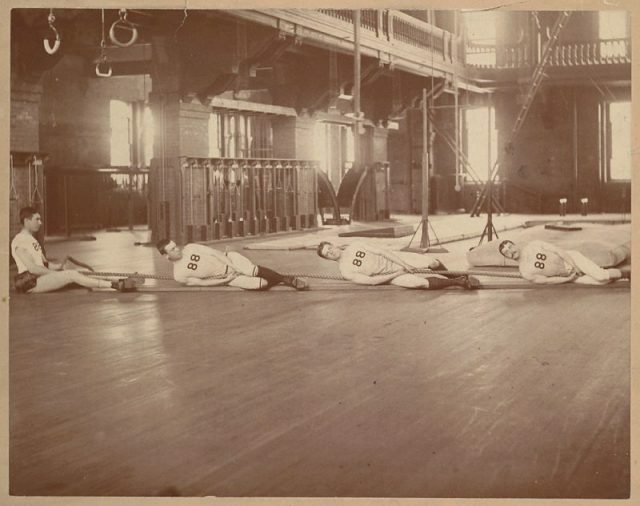 The sport called for two teams of eight to try to pull the other six feet. If neither side could do it, the judges started a five minute overtime. If, at that point, neither team had pulled the other the requisite six feet, the winner was the team who had gotten the other the farthest. The British dominated the event, winning two golds and one silver over the years. Each British team was made up mostly of the largest British “bobbies” from the London City police. An event that more resembles a backyard pool game for bored kids on summer vacation than an Olympic sport, distance plunging consisted of a…“plunger”? “diver”? “swimmer”? Launching themselves into the water and seeing who could “glide” underwater the farthest. Competitors were scored for sixty seconds or whenever they surfaced. Referees then measured the distance covered. 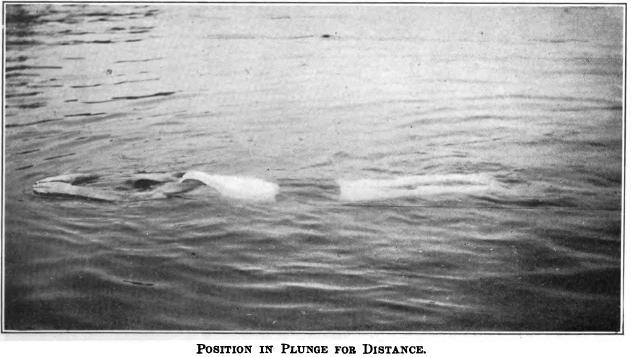 There was only one Olympic round of Distance Plunging, and it was won by American William Dickey – of course he was American! Not because Americans have dominated the Summer Olympics, but because Americans were the only competitors. 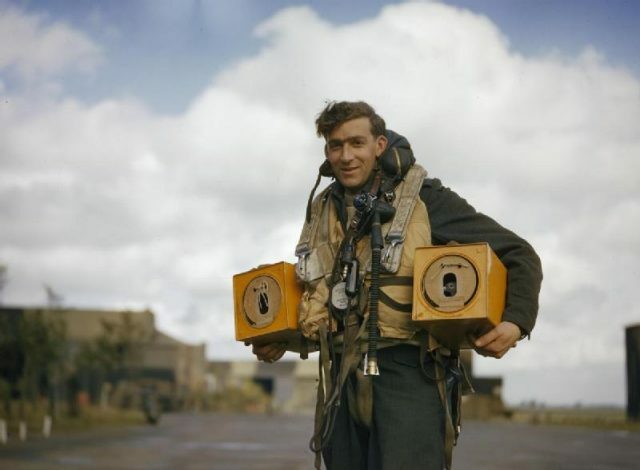 Canadian PO (A) S Jess, wireless operator of an Avro Lancaster bomber operating from Waddington, Lincolnshire carrying two pigeon boxes. No, that wasn’t the title of the sport, but it should have been, because that is exactly what it was. At the 1900 Paris Olympics, 300 pigeons were killed by shooters with shotguns. Strangely enough, clay pigeon shooting was also an event, but somehow (maybe the French taste for squab?) real pigeons also became the targets. 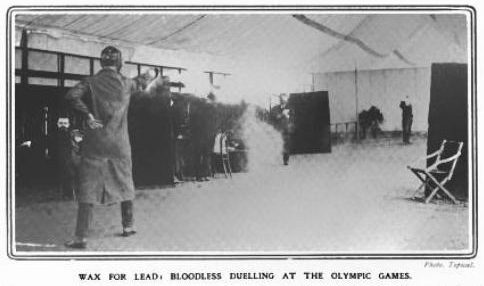 The International Olympic Committee (IOC) decided that perhaps the event shouldn’t make it into the London Games of 1908, but they did feature deer shooting – take a breath, they were cardboard cutouts. Tug O’ War is something many kids look forward to in gym class, but on the opposite end of the spectrum is the rope climb. Many a traumatic childhood moment at the base of the rope climb have been featured in movies, and odds are, many American kids, especially us larger ones, have a story or two (neither of them pleasant) about the rope climb. 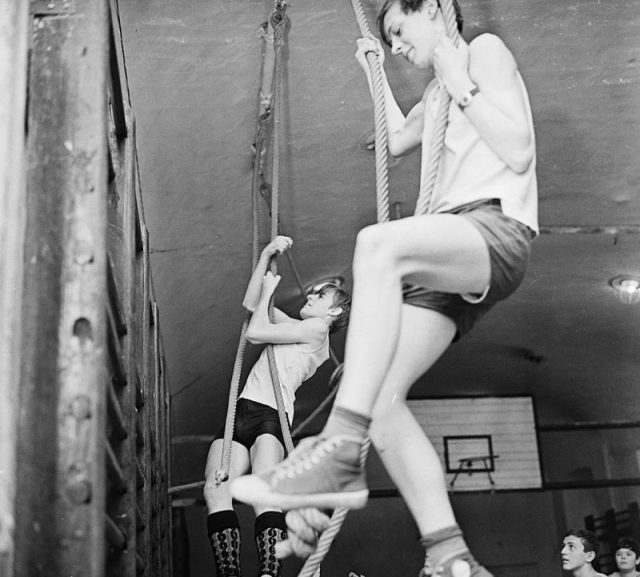 The Rope Climb was an Olympic event from 1896 to 1932. 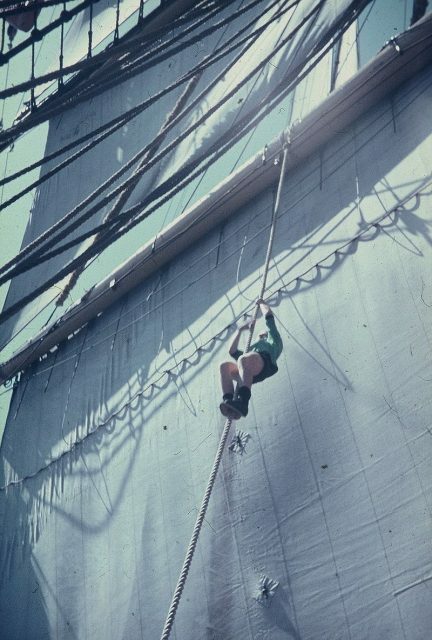 The 1896 rope climbers were judged not only on how fast they made it to the top, but on the style with which they did it. Talk about subjective. All events after that judged on speed only, however, and whoever made it to the top of a 25-foot rope won. The most impressive win was probably in the 1904 St. Louis games, when American George Eyser, a gymnast, took the event, despite having a wooden leg. Okay. You say this is still an Olympic event. Some might say a silly looking one, but still in the Games. But what you may not know is that the Games once included “Solo Synchronized Swimming”. Huh? How is that even possible? How do you synchronize with yourself? However, if you think about it, synchronized swimming is much like dancing, and if you’ll excuse the bad Billy Idol pun, solo synchronized swimming is much like dancing with yourself. It’s all rhythm. And actually the event is really hard. The event appeared in 1988 in Seoul, and lasted through the Barcelona Games in ’92. After that, solo swimmers had to join a duo or a quad to compete. There is no male synchronized swimming, thank the Lord. 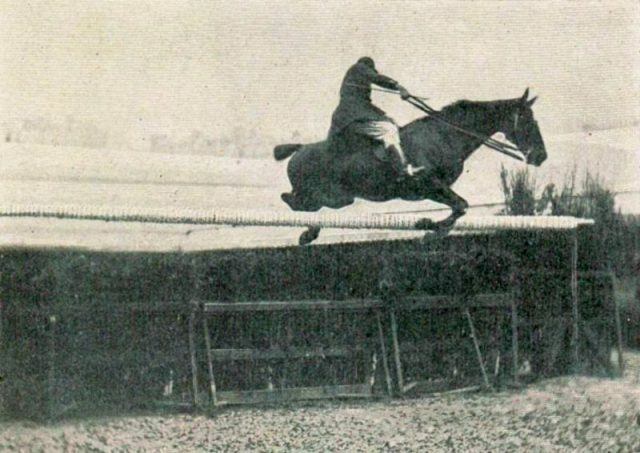 Equestrian show jumping is both a team and solo event in the modern Olympics, but in the 1900 Paris Games, horses and their riders competed in the Long Jump. Though it can be blamed on soggy ground, the equestrian long jump, won by a Belgian horse and rider, was only 6.10 meters or 20 feet. The world (not Olympic) record human long jump is Mike Powell’s 1991 of 8.95 meters or 29′ 4 ¼”. The event only made one appearance. One of the events was the shooting of dueling pistols. Why was it called that and not just “pistol target shooting” or something? Because the competitors shot at targets dressed like them, in the popular upper-class frock coats of the time. The event was a trial event, and only made an appearance once – at the 1906 Intercalated Games in Athens, an event in which Olympians competed to hone their skills prior to the “real” games and trial events were given an outing. The perennial summertime game, which anyone will tell you usually goes unplayed at picnics, at least in the US, was once an Olympic sport but it only appeared once – at the Paris Games of 1900. I was surprised to learn that no Englishmen competed in this seemingly very English event – all the sportsmen were Frenchmen. What? Yes, “roque”. If you think that the IOC made a wise choice in eliminating croquet from the Games, think again. 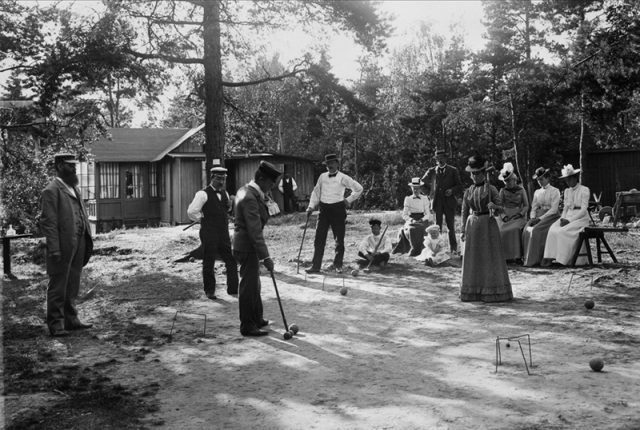 In the 1904 St. Louis Games, an American variant of croquet made an appearance. Roque was/is very similar to croquet, but it is played on a hard surface 30′ x 60′ with borders. The wall used to keep balls in play is used to bank balls much like in pool or billiards. The wickets are the same as in croquet, but the mallet handles are smaller…there are other differences too, but to be honest, no one cares – the “sport” is pretty much extinct, and it was only played in the Olympics once.